Hare Barley (Hordeum murinum ssp. leporinum) is a monocot weed in the Poaceae family. In New South Wales this weed first evolved resistance to Group A/1 herbicides in 2001 and infests Canola. Group A/1 herbicides are known as ACCase inhibitors (Inhibition of acetyl CoA carboxylase (ACCase)). Research has shown that these particular biotypes are resistant to clethodim, and haloxyfop-P-methyl and they may be cross-resistant to other Group A/1 herbicides. Greenhouse trials comparing a known susceptible Hare Barley biotype with this Hare Barley biotype have been used to confirm resistance. For further information on the tests conducted please contact the local weed scientists that provided this information. There is no record of differences in fitness or competitiveness of these resistant biotypes when compared to that of normal susceptible biotypes. If you have any information pertaining to the fitness of Group A/1 resistant Hare Barley from New South Wales please update the database. The Herbicide Resistance Action Committee, The Weed Science Society of America, and weed scientists in New South Wales have been instrumental in providing you this information. Particular thanks is given to John Broster for providing detailed information. Matthews, N. ; Powles, S. B. ; Preston, C.. 2000. Mechanisms of resistance to acetyl-coenzyme A carboxylase-inhibiting herbicides in a Hordeum leporinum population. Pest Management Science 56 : 441 - 447. A failure of acetyl-coenzyme A carboxylase (ACCase)-inhibiting herbicides to control a population of Hordeum leporinum Link [H. murinum subsp. leporinum] (barleygrass) occurred in South Australia following eight applications of these herbicides in both crops and pastures. This population was 7.6-fold resistant to fluazifop-P compared with standard susceptible populations. The population was between 3.6- and 3.8-fold resistant to other ACCase-inhibiting herbicides, except butroxydim to which it was susceptible. ACCase extracted from resistant plants and assayed in the presence of herbicides in vitro was susceptible to fluazifop acid and other aryloxyphenoxypropanoate herbicides, but was 4-fold less sensitive to sethoxydim compared with ACCase from susceptible plants. Resistant plants metabolized fluazifop acid about 1.3-fold more rapidly compared with susceptible plants; however, sethoxydim was metabolised equally in both populations. Resistance to fluazifop-P and other aryloxyphenoxypropanoate herbicides may be the result of increased herbicide detoxification, whereas resistance to sethoxydim appears to be due to a modified target enzyme. Herbicide resistance in this population is unusual in that different mechanisms appear to confer resistance to the aryloxyphenoxypropanoate and cyclohexanedione herbicides..
Purba, E. ; Preston, C. ; Powles, S. B.. 1996. Growth and competitiveness of paraquat-resistant and -susceptible biotypes of Hordeum leporinum. Weed Research (Oxford) 36 : 311 - 317. Growth, competitiveness and seed characteristics were compared in paraquat-resistant and -susceptible biotypes of Hordeum [murinum subsp.] leporinum collected from neighbouring fields near Ouse, Tasmania. In field experiments at Adelaide in 1991, dry weight and tiller production were greater in the susceptible biotype as compared with the resistant biotype in the absence of competition, however, the reproductive output was the same. Competitiveness in the field was estimated using a replacement series design that showed only slight differences between the two biotypes. There were no differences in seed weight, number of seeds per head, seed viability or seedling establishment between the two biotypes. 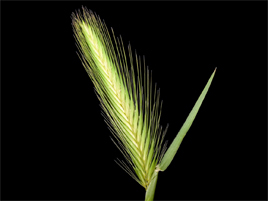 When grown in pots in monoculture, the production of tillers was the same throughout the growing season, but inflorescences appeared on the resistant biotype earlier and matured earlier than did those of the susceptible biotype. It is concluded that under field conditions the resistant biotype did not show a reduction in fitness as compared with the susceptible biotype..
Purba, E. ; Preston, C. ; Powles, S. B.. 1995. The mechanism of resistance to paraquat is strongly temperature dependent in resistant Hordeum leporinum Link and H. glaucum Steud. Planta 196 : 464 - 468. Paraquat-resistant biotypes of the closely-related weed species Hordeum leporinum [H. murinum subsp. leporinum] and H. glaucum are highly resistant to paraquat when grown during the normal winter growing season. However, when grown and treated with paraquat in summer these biotypes are markedly less resistant to paraquat. This reduced resistance to paraquat in summer is primarily a result of increased temperature following herbicide treatment. The mechanism governing this decrease in resistance at high temperature was examined in H. murinum subsp. leporinum. No differences were observed between susceptible and resistant biotypes in the interaction of paraquat with isolated thylakoids when assayed at 15, 25 or 35°C. About 98 and 65% of applied paraquat was absorbed through the leaf cuticle of both biotypes at 15 and 30°C, respectively. Following application to leaves, more herbicide was translocated in a basipetal direction in the susceptible biotype compared to the resistant biotype at 15°C. However, at 30°C more paraquat was translocated in a basipetal direction in the resistant biotype. Photosynthetic activity of young leaf tissue from within the leaf sheath which had not been directly exposed to paraquat was measured 24 h after treatment of plants with paraquat. This activity was inhibited in the susceptible biotype when plants were maintained at either 15 or 30°C after treatment. In contrast, photosynthetic activity of such tissue of the resistant biotype was not inhibited when plants were maintained at 15°C after treatment, but was inhibited at 30°C. The mechanism of resistance in the biotype of H. leporinum correlates with decreased translocation of paraquat and decreased penetration to the active site. This mechanism is temperature-sensitive and breaks down at higher temperatures..
Purba, E. ; Preston, C. ; Powles, S. B.. 1993. Paraquat resistance in a biotype of Vulpia bromoides (L.) S. F. Gray. Weed Research (Oxford) 33 : 409 - 413. Laboratory experiments were conducted to study a biotype of V. bromoides which had survived field applications of 125 g/ha paraquat and 75 g diquat in a lucerne field at Elmhurst, Victoria. Pot-grown resistant and a susceptible biotypes of V. bromoides were sprayed with paraquat at concn of 12.5-800 g and diquat at 25-800 g. Applications of paraquat at 50 g killed all of the susceptible V. bromoides plants but only 6% of the resistant biotype. The LD50 for paraquat of the resistant biotype was 5- to 6-fold higher than for the susceptible biotype. The resistant biotype was also resistant to diquat, but was susceptible to glyphosate at 720 g and metribuzin at 300 g. Application of 100 g paraquat at anthesis completely suppressed seed set of the susceptible biotype and reduced that of the resistant biotype by 95%. Seed set by the paraquat-treated resistant biotype, however, showed little reduction. This is the 4th species to have been found to be resistant to bipyridyl herbicides in this field; the other herbicide resistant weeds are Hordeum glaucum, H. leporinum [Hordeum murinum subsp. leporinum] and Arctotheca calendula..
Davis, R. C.. 1992. Agrichemical industry initiatives to combat development of herbicide resistance. : 144 - 147. Currently 6 species of 4 weeds in Australia are resistant to herbicides. They are Hordeum glaucum, H. leporinum [Hordeum murinum, subsp. leporinum] Arctotheca calendula, Lolium rigidum, Avena fatua and A. sterilis. Resistance in L. rigidum is rapidly spreading and is a serious threat to viable winter cropping. Many, but not all, selections of L. rigidum exhibit cross and multiple resistances. A. fatua and A. sterilis resistance is likely to spread rapidly and become a serious problem if farmers don't quickly adopt measures to check its development. The Australian agricultural chemical industry has formed, under the auspices of the Agricultural and Veterinary Chemicals Association, a Herbicides Resistance Action Committee to assist farmers to combat the threat of resistance. The committee formulates and promotes the industry's strategies to minimise the risk and delay the development of resistance. The committee's current emphasis is focused on strategies to combat L. rigidum, A. fatua and A. sterilis..